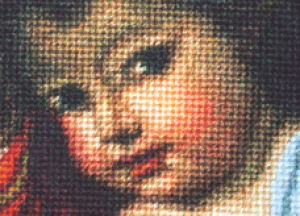 Faces can be tricky to needlepoint to give them expression and realism. 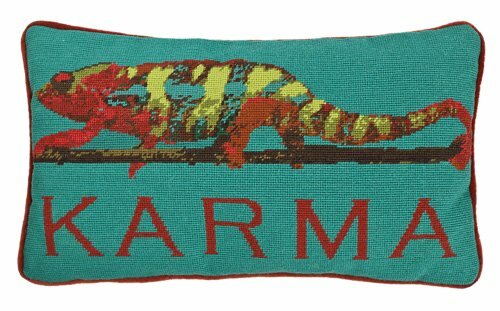 Each situation is different but here are some general ideas to consider when stitching a face on your needlepoint canvas. A tent stitch is almost always the best way to needlepoint the skin of a face. 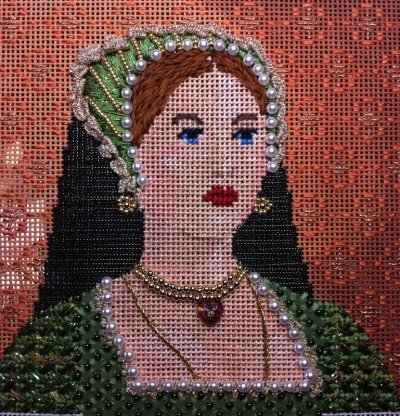 There are very few situations where a better result is achieved by using an alternative stitch - maybe if the face was a large part of the design then using a Satin Stitch might allow for multi-directional stitches and the play of shadows on the face. So, when it comes to skin, try to curb any tendency you may have to want to cover your canvas in decorative stitches. Instead, save the decorative features to add facial features like eyebrows, beards, eyes. Fuzzy fibers are also useful for stitching eyebrows and beards. stitches and fibers for the features. 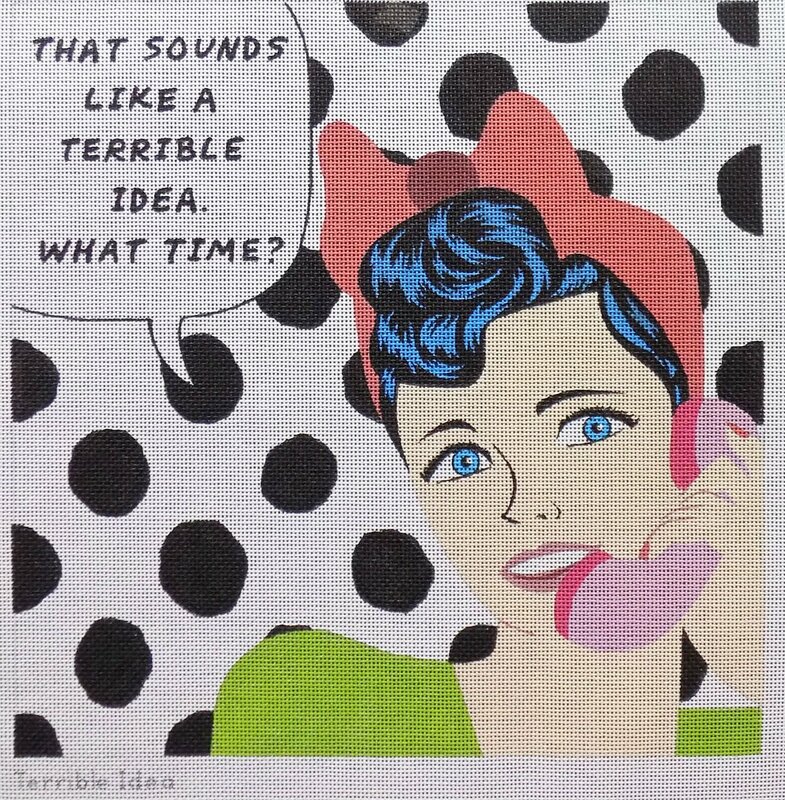 Image from Labors of Love. 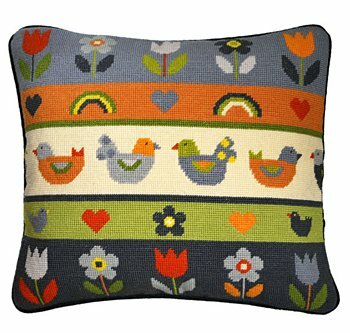 A needlepoint face is almost always improved by blending colors. Faces have planes, shadows and ridges, and when the area you are stitching is small, these details are best brought out with shading. 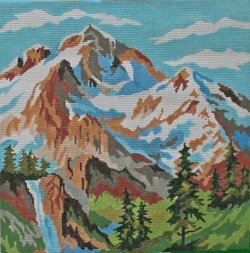 So, even if your needlepoint canvas is not printed or painted with shading on the face, think about how you might apply subtle color changes to enhance these details. For example, use a few stitches of a slightly darker/pinker shade to highlight a cheek bone. Similarly, consider where the shadows might fall on the face you are stitching and apply a slightly darker shade in these areas. This might be around the inner eye, around the nose and under the chin. You can blend threads of different colors in the needle to get subtle color gradations (if your thread is stranded) or you can purchase threads in different shades and strategically apply them. When stitching a face some features may look better stitched in afterwards as top stitching. These could be the outline of the eyes; defining a nose and chin, some subtle wrinkles, eyebrows. Consider all of the elements of the face and think about which, if any, you might want to apply later over a tent-stitched base using a single, thin strand of thread as a back stitch or other form of top stitching. It’s hard to imagine that a metallic thread would have any business being stitched onto a face, but there is at least one instance in which a stitch or two of a carefully chosen metallic, or other high sheen thread, might be called for - and that's the eyes. The reflective quality achieved by adding a stitch or two of metallic can add “life” to the eyes and face. Beads can have the same effect. 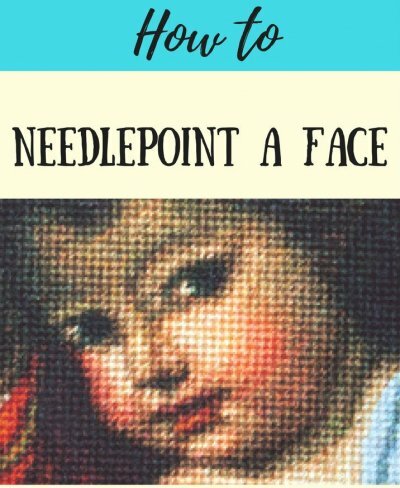 We hope you have found these ideas for how to needlepoint a face useful. Let us know if you have tips of your own you would like to share. You'll get exclusive content like what you've just read, you'll hear about new designs and kits as soon as we receive them, plus we run a lot of specials on popular items that only our newsletter readers hear about. AND, you'll receive a coupon code for 10% off your next order.